Around 24,000 children are injured in shopping cart accidents every year, typically as a result of falls or the cart tipping over on top of them. Runaway carts are also a threat. A woman in China was killed in 2013 after being struck by an unmanned cart that rolled down an escalator. What can be done? Retail stores can reduce shopping cart injuries by investing in child-friendly carts. Parking lots should have cart corrals sturdy enough to secure large volumes of carts safely. Slips, trips and falls are among the most overlooked accidents that occur in grocery stores. Across all workplaces, these types of accidents accounted for 27% of all missed days of work in 2014—more than the number of days caused by contact with equipment. What can be done? Aisles should be kept free of clutter. Spills should be blocked off and cleaned up immediately. Grocery stores are subject to the constant threat of shopping carts and other rolling equipment. Dings, scrapes, bumps and bruises take their toll on your walls, cases and other fixtures—leading to costly repairs and maintenance. What can be done? 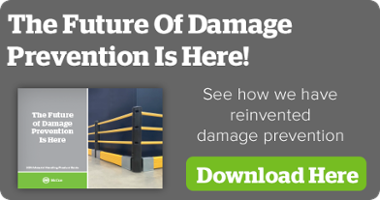 Making proactive investments in asset protection solutions such as bumpers, rails and corner guards will extend the life of your infrastructure. And don’t forget your back room, either. If anything, there are more hazards back there. Grocery store customers are always reaching for items on shelves, and metal shelving can sometimes have sharp corners and jagged edges. And heated items such as rotisserie chickens are kept on hot surfaces. What can be done? Shelving corners should be outfitted with protective padding and any hot surfaces should be clearly labeled. Grocery stores have aisles upon aisles of dangerous chemicals from cleaning supplies, cosmetic products, insect sprays and more. Customers may become exposed to containers that have been compromised. What can be done? Display only a limited amount of such products on the shelves at any one time while storing the remaining inventory in a back room. Encourage employees to carefully inspect each item prior to putting it on the shelf when stocking. The dangers of a grocery store certainly don’t stop with customers. Employees are exposed to threats such as forklifts, pallet jacks and other machinery. At McCue, we design products intended to increase the safety of employees and customers alike at grocery stores, warehouses, distribution centers and other facilities. Request a catalog to see how we can make your grocery store a safer place.